After completing a search of a hotel room, officers located a large quantity of methamphetamine, heroin, prescription medications and marijuana. Officers also reportedly seized a large quantity of money, a 9 mm handgun and a X26 Taser along with digital scales. GALLIPOLIS — Gallipolis Chief of Police Jeff Boyer stated that a search warrant was obtained and served Saturday by the Major Crimes Task Force of Gallia–Meigs after a joint investigation by the Gallipolis Police Department and the Major Crimes Task Force with the assistance of Gallia County Prosecuting Attorney Jason Holdren which resulted in the arrest of two. Boyer said the search warrant was served during the early morning hours by the Gallipolis City Police Department and Task Force agents at a hotel in the 100 block of Upper River Road. After securing the room, James Derek Armstrong and Jack D. Russell, both of Gallipolis, were detained while officers searched the room. After completing a search of the room, officers reportedly located a “large” quantity of suspected methamphetamine, heroin, prescription medications and marijuana. Officers also seized a large quantity of money, a 9 mm handgun and a X26 Taser along with digital scales. Task Force Agents arrested James Derek Armstrong, 46, on a felony charge of possession of drugs and Jack D. Russell, 36, on a failure to appear warrant from the Gallipolis City Municipal Court. Both are being housed in the Gallia County Jail awaiting court appearances. Boyer states more potential charges are being reviewed and expected in this case. 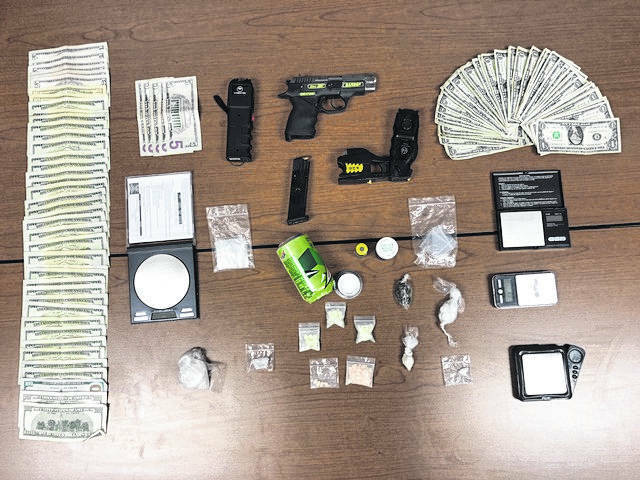 https://www.mydailytribune.com/wp-content/uploads/sites/42/2018/10/web1_IMG_0432-1-1-2.jpegAfter completing a search of a hotel room, officers located a large quantity of methamphetamine, heroin, prescription medications and marijuana. Officers also reportedly seized a large quantity of money, a 9 mm handgun and a X26 Taser along with digital scales.